Users can not imagine how Bazik has evolved with this new version. A totally new architecture to be fully cross-compatible. Yes, now it’s done, Bazik is running on Windows. And the new version 1.10 is available for Mac & Pc, direct to the homepage. No demo version, with this version you can activate directly after buy by enter the license key. Copy & Paste key has been added to be more friendly. Windows addict can enjoy Spout integration, as Syphon for OSX. You can hide the render window if you share it with an other app (hit « h » key). And everyone can now use the Warp output option, an integrate 4 points warp engine for help you quickly set-up in any case. 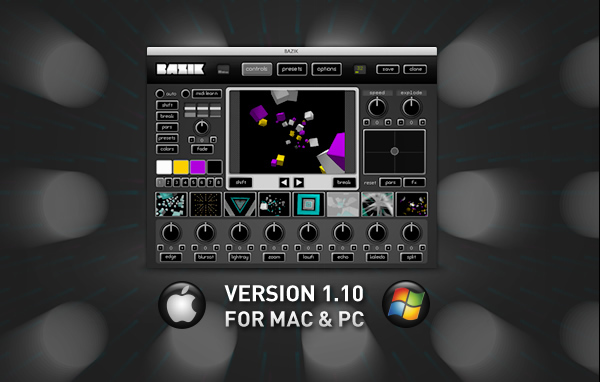 Bazik Live 1.10 is available now and includes a number of bug fixes. It is recommended that all Bazik users upgrade to this version. Use the direct link on the homepage to download the last current version. Bazik Live can be purchased online for 99€.